Maze of Peril Ch 1, Scene 7: "The Grisly Business of Swallowing the Corpses"
The party wins their first combat, and Zereth directs them in standard D&D post-melee activities — searching the corpses (no treasure is mentioned), retrieving arrows, guarding the passage, checking for injuries (none are noted). Murray dissuades them from hiding the corpses as a waste of time, which proves prescient. "More dark side corridors, some less than five feet wide, opened to the north. A glow of light ahead resolved, as they approached, into a diffuse beam of sunlight coming down a shaft in the ceiling which illuminated a round pit in the floor. Two thick wooden doors in the south wall were visible by the sunlight, both tight shut. At the lighted shaft, Boinger noted, there was a broad cross corridor and a narrow, darker passage intersecting the tunnel they were in." These details closely match one of Holmes' original dungeon maps, a sheet adjacent to the one shown in my previous post. In fact, the details match this map so closely that I feel Holmes must have been consulting it while writing this part of the story. Below is the relevant portion with color annotations added by myself. The main corridor runs east-west, 25' wide at a scale of 5' per square. Narrow side corridors open to the north, two doors are in the south wall, and "The Pit" is at the intersection with a broad cross corridor. The orcs attacked while the party was examining the Pit, coming up behind them from the west ("Orc Battle"). Boinger suggests investigating the two doors, which are the first doors they've found in the dungeon. They handle these in typical OD&D fashion — Bardan and the two men-at-arms bash one open, finding nothing (room above labeled "Empty"), and Boinger listens at the other. He hears nothing, but on bashing this one open they are are surprised by an "orange mass". Zereth recognizes this an Ochre Jelly, which is a "giant amoeba" member of the "cleanup crew" of Vol 2 of OD&D, and Holmes has it attack accordingly in a nice bit of description — a "long pseudopod of glistening, translucent orange tissue thrust through the gap as the door was pulled shut". The closing door severs this pseduopod, which continues to attack, and a further slash with a sword similarly divides it into two smaller globs, in accord with OD&D ("hits by weaponry ... will merely make them into several smaller Ochre Jellies"). Bardan wisely suggests burning it with a torch, which is successful, and also in accord with the original description ("can be killed by fire or cold"). Thus they survive their second melee. Next, Boinger's "keen ears" detect an approaching sound. While in OD&D, Vol 3, Elves, Dwarves and Hobbits all have an increased chance to hear noise (1-2 in 6 versus 1 in 6), here Boinger clearly has better hearing than the elf or dwarf in the party. In Greyhawk, Hobbit thieves get an extra +1 to Hear Noise, which advances the idea that Hobbits have the best hearing of the non-humans. The sound resolves into a grating noise like someone "dragging a sack of heavy rocks down the tunnel", disturbing enough that Murray suggests they head down a side corridor. They then double back "into another corridor, this one only ten feet wide and black as pitch", where they put out their torches and wait ("Hiding Place" marked above). Here Zereth they find a "a narrow passageway" that Zereth believes will lead "back toward the intersection", so he and Boinger use this to investigate the noise further. On the map above, this is the five-foot passage paralleling the wider north-south passage. Back at the intersection, our two heroes spy a huge Purple Worm, now in the "grisly business of swallowing the corpses" of the orcs, armor and all. Per OD&D Vol 2, Purple Worms are sufficiently large enough to swallow opponents in combat. The party had earlier noted the worm's trail throughout the main corridor, and now they have found it. They quickly head back to the party. The original illustration of a Purple Worm from OD&D Vol 2, page 5, possibly by Dave Arneson. Next up, we finally reach the last scene of Chapter 1! This illustration by Larry Elmore is from a fairly obscure product, the manual for the 1982 adaptation of TSR's boardgame DUNGEON! for the Apple II+. 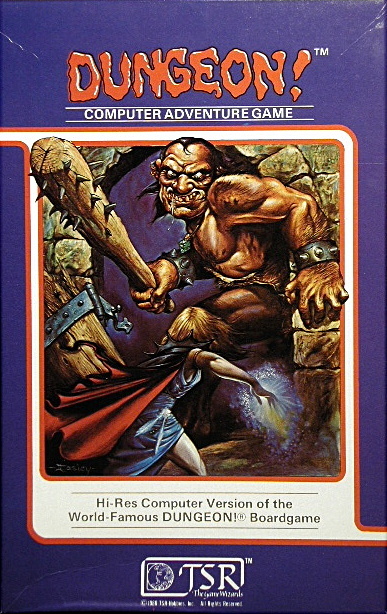 It's on the last page, and is the only illustration in the manual other than the cover, which shows a B&W version of the box cover art by Jeff Easley. It may have appeared in another TSR product, but a Google Image search didn't turn anything up. While much smaller --- perhaps a Sub-adult? --- Easley's dragon clearly shares many details with David Sutherland's Red Dragon on the cover of the Holmes Basic Set (July 1977), particularly the head - triangular, heavy brow, cheek "whiskers". Also note the V-shaped scales down the ventral portion of the neck, the slightly curved spikes down the back, even the shapes of the scales. A Red Dragon does appear as one of the monsters in Dungeon!, so Elmore may have been using one of these as a guide in order keep the look consistent between TSR products. If you'd like to see the entire game manual, it can be found here at the Museum of Computer Adventure Game History. Update: As pointed out by John L in the comments, here is Bill Willingham's take on a similarly styled dragon, from the Moldvay Basic Set rulebook (1981). Most of my RPG-related writing can be found here on the blog or on the sporadically updated Zenopus Archives site. But I do have a few articles that have been published in print or pdf. In view of my recently published zine article, I thought it was time to write up a list of these, which will have a permanent home here on the site. "Clerical Cosmic Horror: The Brief Era of the Cthulhu Mythos as Dungeons & Dragons Pantheon" in Bayt al Azif #1, October 2018. With an illustration by Chris Holmes. Currently available in pdf or print (softcover or hardcover). See also this post. "Holmes and the Lost City" in The Lost City Campaign Sourcebook, March 2018. With an illustration of Zargon by myself. This is a fan compilation of supplementary material for the module B4; see this DF thread. Currently available as a free pdf. "Axel the Dwarf" (NPC) in FANTASTIC! EXCITING! IMAGINATIVE! #2, Nov 2017, Inner Ham. With an illustration by Jon Wilson. Currently available in pdf from DrivethruRPG or in print directly from the publisher. "Green Grabber" and "Old One" (new monsters) in BLUEHOLME Journeymanne Rules, Fall 2017, Dreamscape Design. Old One illustrated by Bradley K. McDevitt. Currently available in pdf from DrivethruRPG, or in hardcover or in softcover from Lulu. See also the original posts here and here. "The Writings of J. Eric Holmes" and "Annotated Bibliography for J. Eric Holmes" in Tales of Peril, the Complete Boinger and Zereth Stories of J. Eric Holmes, Summer 2017, Black Blade Publisher. Currently available in print directly from the publisher. See also this post. "Regal Lizard Man" (new monster) and "Harpy Axe" (new magic item) in FANTASTIC! EXCITING! IMAGINATIVE! #1, March 2017, Inner Ham. Currently available as a free pdf from DrivethruRPG or in print directly from the publisher. See also this post. "Lesser Magic Items" (20 new magic items) in Dungeon Crawl #3, Summer 2013. With three illustrations by John Blaszczyk. Currently available in pdf from DrivethruRPG or in print from Lulu. See also this post. I also contributed to proofreading the original release of the OD&D retroclone Delving Deeper, 2012, Immersive Ink, currently available in pdf or free on the web.